Apple's controversial new iOS 6 Maps App could have had another year's gestation as its deal with Google Maps had at least another 12 months to run. 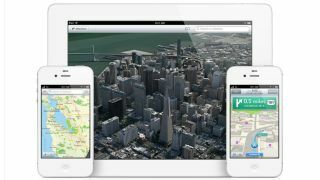 According to two sources, Apple decided to run with its own maps app quite some time before WWDC in June. It seems the Cupertino crew weren't happy that Google's iOS Maps app was falling behind its Android equivalent, nor that Google wanted to add in more of its own products into the mapping mix. The sources claim that rumours of the de-Googlification of iOS Maps spurred Google into action, working on a competing maps app of its own. The Google made app is apparently still in development and won't hit handsets for several months at least. We can believe that although it doesn't exactly echo what Eric Schmidt told reporters yesterday, specifically that "we have not done anything yet". Complaints about the native iOS 6 Maps have flooded in since the new software hit handsets last week, with spelling mistakes, error-ridden cartography and shoddy satellite imagery abounding.